I am an unabashed fan of modular helmets. Once I discovered the freedom they allowed while riding, I began using them for the majority of my street rides. The option to flip up the chin bar at stoplights or gas stations makes communicating much easier. Then there’s the relieved look that convenience store clerks have when they realize they can actually see your face as you walk into the store to buy a bottle of water. 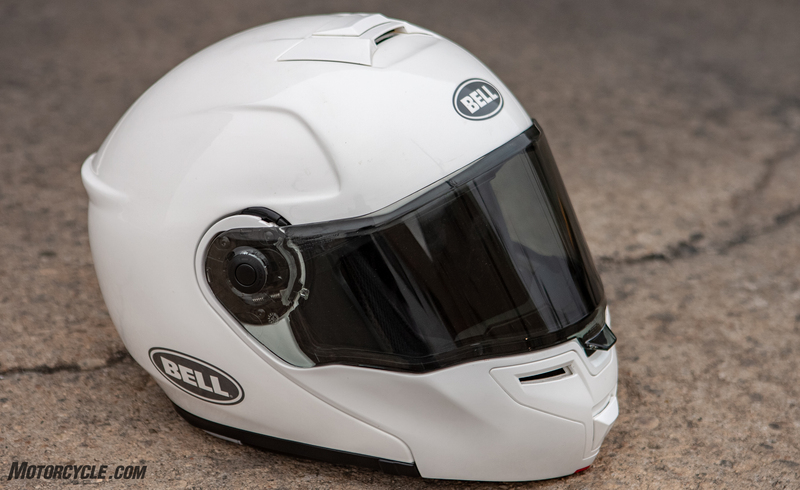 Bell Helmets recently hosted the moto-press on a ride to sample the company’s newest entry in the modular helmet market, the Bell SRT-M. While quick, reasonably accurate opinions can be made after just a few hundred miles in a new helmet, I was fortunate enough to be given advanced access to a SRT-M for several weeks before the event, allowing me to become quite familiar with the new lid. The SRT-M features a lightweight fiberglass composite shell in one of two sizes, XS-L and XL-3XL. The EPS protective liner has an oval head shape that comfortably fits my long-oval XL noggin. Inside the protective layers, the anti-bacteria comfort liner is removable and washable to help prevent helmet funk that can develop in hot weather riding. The liner is also eyewear compatible, which means you can wear your prescription glasses or your favorite shades without pain. The fit for my glasses is just snug enough to keep them from sliding down my nose if I hit a bump while in a sport riding position. 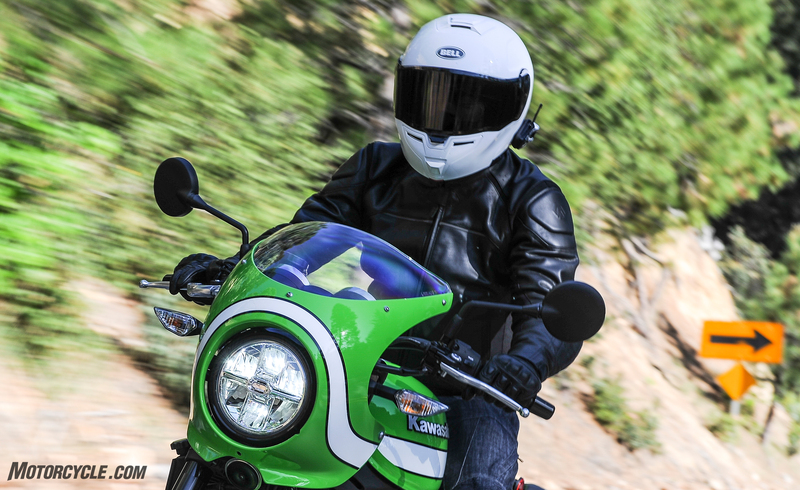 The Bell SRT-M helmet (shown here with the optional photochromatic ProTint visor) slices through the air without any lift or jostling at speed. 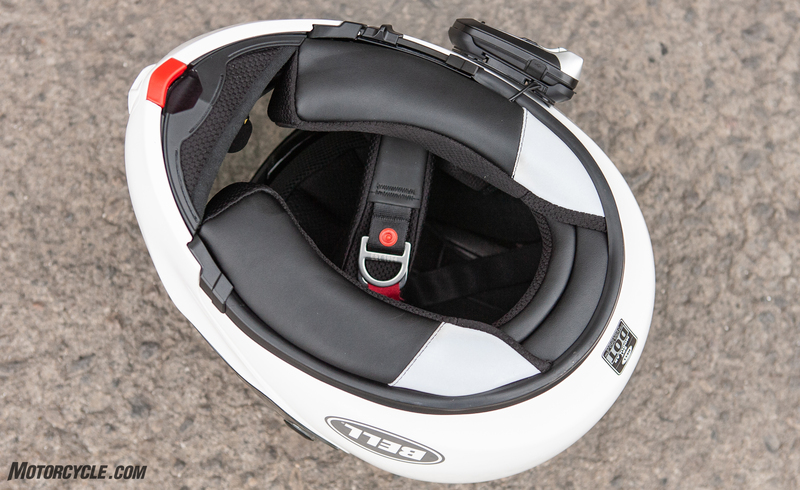 As with many helmets currently in production, the SRT-M has speaker pockets molded into the EPS liner so that one of the many helmet communicators can be easily fitted. However, unlike some manufacturers, the speaker pockets are located exactly where my ears are, making optimal speaker placement possible. At the top of the helmet’s main body, an internal sun shade drops down for on-the-fly adjustment. The shade is operated by two cables and a sliding lever on the lower left edge of the helmet. The shade action is fluid and easy. However, the sun visor did occasionally droop a quarter inch or so into my field of view if I didn’t make sure to slide the lever into the full-open detent. Unlike some sun visors, the SRT-M’s comes down to fully cover my face, leaving no room for glare to reflect up off the road and under its tinted protection. Finally, the lower edge of the internal visor has a lip that looks like it will help guide the airflow to prevent fogging in cold/wet weather – neither of which I’ve experienced here in SoCal lately. The sculpted comfort padding at the base of the helmet provides a good seal from the wind, but the chin curtain could be a little larger. Note the red chin bar release lever. The communicator mounted on the helmet is part of a future product review. The SRT-M’s wide visual field comes from Bell’s class 1 Panovision Shield. For the most part, the Panovision Shield and the helmet body makes a solid seal with the helmet’s and chin bar’s gaskets. However, the portion of the shield that is closest to the visor/helmet pivot point has a slight gap. While this may allow water into the helmet during rain, the gap is well out of the rider’s field of vision. Although I didn’t get to test the visor’s anti-fog coating (which, according to Bell, passes the stringent ECE standard), the visor can be cracked open slightly above the locked position to allow shield-clearing airflow when needed. The chin bar openings offer plenty of airflow. 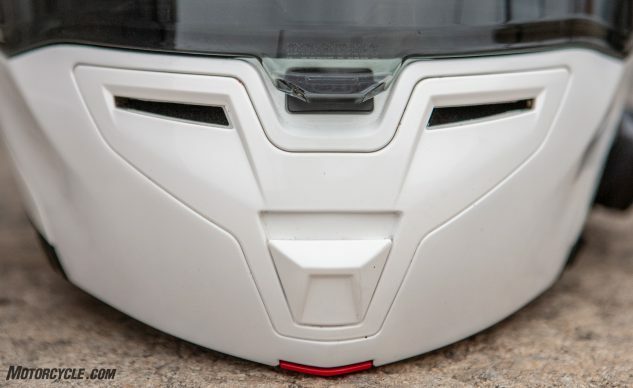 Venting from the SRT-M comes courtesy of two chin bar ports just below the visor and one centrally-located opening at the top of the helmet. Operating the vents is easy to do with a gloved hand. 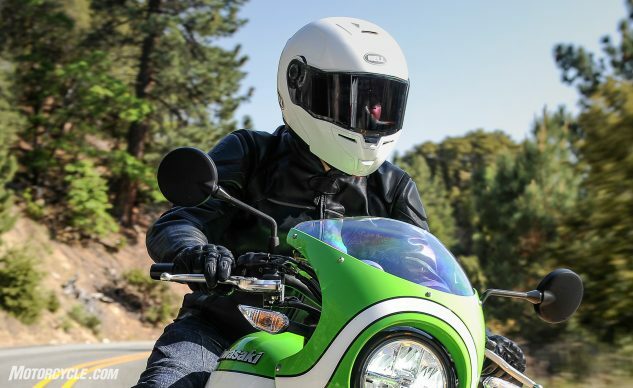 Hot air is pulled out into the low pressure zone directly behind the helmet at speed via two always-open vents. The venting was good and didn’t increase the helmet’s noise level when open. The chin bar opens easily by pressing a lever under the front edge forward, which meshes nicely with the natural motion of lifting it open. 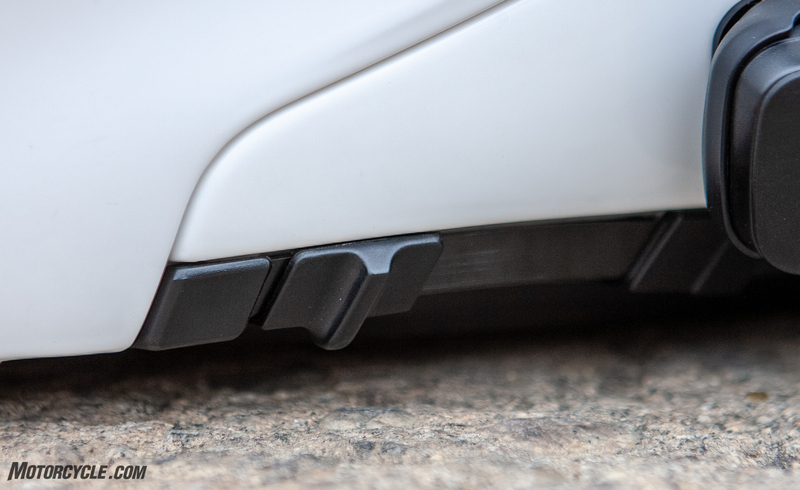 In the fully open position, a detent prevents the chin bar from falling closed if you are one of those people who likes to ride with an open-face helmet at times. Additionally, there is a small gray sliding lock at the left temple that further prevents the chin bar from falling down, though I rarely used it. 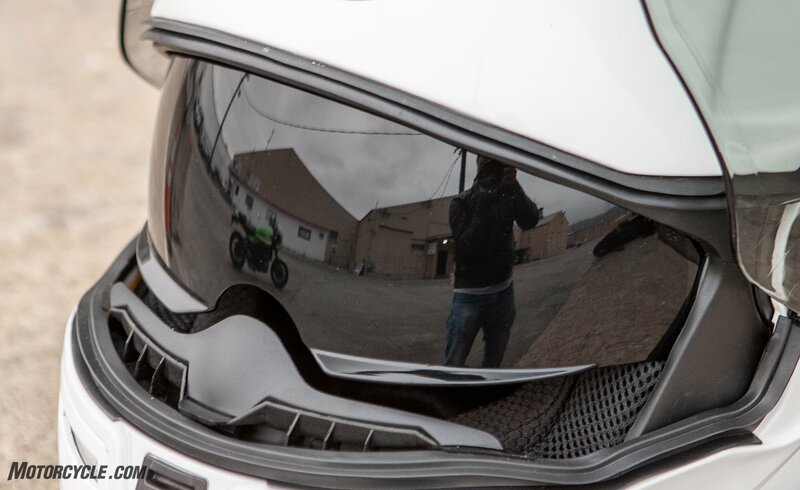 Unlike some helmets with internal sun visors, the SRT-M’s visor comes down low enough to prevent glare from sneaking in from below. Donning the SRT-M is easy with the chin bar up, and as you close it, the cheek pads give a comforting squeeze as the helmet locks closed. The interior of the helmet has the premium feel of one costing hundreds of dollars more. The internal sun visor operated via cables and this slide on the bottom left of the SRT-M.
Once underway, the helmet shape keeps the SRT-M from interacting with the wind in any way – even during head-checks before changing lanes. In fact, the only place where I felt the SRT-M was a bit lacking was in its propensity for wind noise. Starting at about 45 mph and getting more intense at higher speeds, the noise level was noticeably higher than the Shoei Neotec II that I frequently wear. This comparison is important since modular helmets are usually noisier than full-faced helmets. The top vent is easy to operate with a gloved hand. However, I accidentally discovered a way to dramatically lessen the noise. I noticed that, when I installed the latest CardoSystems PackTalk Bold communicator (for a future review), filling the pockets in the EPS liner with the speakers (and additional spacer required to get them as near to my ears as possible) pressed the helmet’s comfort liner close to my ears, resulting in a much quieter fit. So, SRT-M owners can fill this space with soft open-cell foam padding and reduce the helmet’s wind noise! 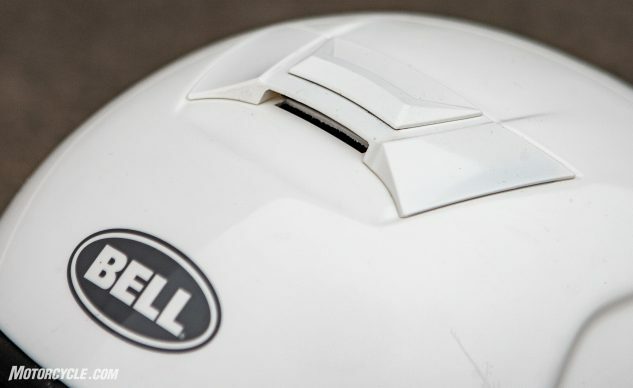 Over the course of the last month, I’ve ridden quite a bit in the Bell SRT-M helmet and have come away impressed – that was even before I knew what the MSRP would be. When I received the press release that listed the retail price as $349.95, I was shocked. I fully expected the helmet to come in at the $500 range. Also, that price is for all the SRT-M styles, not just the solid colors, like the white one that I tested. Really quite impressive. I have more good news, too: The Bell SRT-M will be available to the public in just a few weeks. At the end of June, dealers nationwide will begin selling this new offering from Bell.